A magazine subscription is a great gift that will keep giving all year round, but many, if not most of the children’s magazines on the shelves fall back on tired old pink/sparkly and blue/camo stereotypes. We’ve picked out a few publications which appeal to boys and girls with different interests. 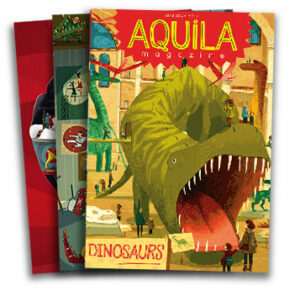 Aquila describes itself as a ‘fun educational magazine for children who enjoy challenges’ and ‘an intelligent read’, and it’s certainly pitched towards highly motivated and able readers. Each issue focuses on a theme, such as Dinosaurs, Harry Potter, or Money, and brings together themed articles, puzzles, stories and craft or science projects. It’s a lot more text-heavy than many of the magazines we looked at but it’s beautifully illustrated throughout and will appeal to readers who love to really dig into a subject. 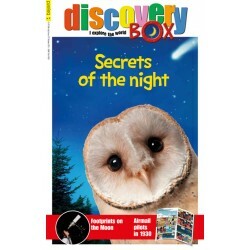 With its slogan ‘I explore the world’, each issue of Discovery Box digs into a theme of science, history or geography, exploring it through factual articles, photostories, comic strips and infographics. Recent editions have looked at Volcanoes, Exploring the Oceans and China. It’s colourful, glossy and very visual, making it a great choice for reluctant readers, who can snack on bitesize text and accessible formats, though the content will certainly stretch and interest more confident readers. A balance of boys and girls are featured in the regular features such as photostory investigations and comic strips, and the only ads are for other Bayard magazines. Ten issues a year. 52 pages. Subscription only – £50 for 12 months. Perfect for: 8-12 year olds with a wide range of interests, particularly those who might find a whole chapter book a bit intimidating. 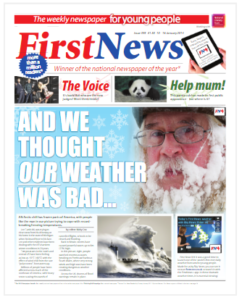 First News calls itself the UK’s only national newspaper for children (now with an online news channel and a tablet edition too) and claims over 2 million child readers between the ages of 7 and 14. The tabloid format makes it feel like a real grown-up paper, while the bright colours and lively layout make it easy to scan and dip in and out. First News presents serious topical issues such as the refugee crisis or the US elections in a straightforward and accessible way for young readers, balanced with lighter news, comics and jokes, interviews with kid-friendly sports or TV celebrities, competitions and features. This also means the content isn’t too time sensitive – these papers are fun to re-read. There’s a good balance of males and females in the children and adults shown in images – let down by the sports pages, like many newspapers. There are a few ads and some sponsored content for age-appropriate toys, films or books. Weekly, 28 pages. Subscription £62.79 for 12 months, or £1 trial for first three issues. Also widely available in newsagents. 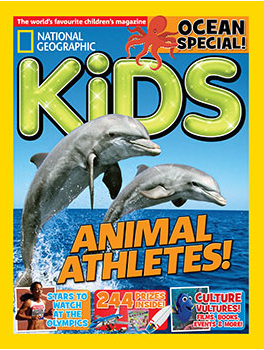 The natural world makes up a large part of the content of NG Kids, as you would expect, with lots of top quality animal photographs, but there’s also info on technology, history, films and books, world records, and lots of chances to win prizes such as books, models, and toys. The issue we reviewed came with three gifts attached to the cover – pokemon cards, a glow in the dark dinosaur head and an eraser shaped like a unicorn. The information is presented in small snippets with lots of photos, and the longer features are also broken down into bite size pieces. Overall there’s a good mix of interests and genders throughout. Features in this issue included a piece on animal winter coats, a piece on how gibbons communicate, an interview with the world’s only female high altitude archaeologist and a tour of an aeroplane factory. There’s also a comic strip, Max the Mouse, in which an explorer mouse takes us on an amusing journey through history (though this page was rather short on female characters). Our Kid Reviewer enjoyed the the back ‘fun stuff’ pages which had content such as the ‘funny fill-in’ page where different word types are placed in a story to make it ridiculous. Monthly. 52 pages. Subscription £36-£50 per year depending on package, digital edition also available. £4.25 per issue – widely available in newsagents. 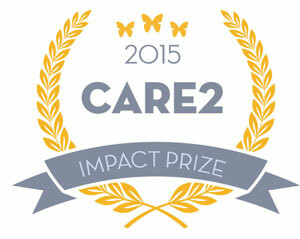 Perfect for: 7-12 year olds interested in animals, science and the natural world. 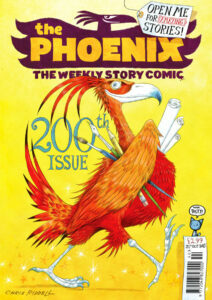 The Phoenix is a weekly story comic aimed at 6 – 12 year olds filled with funny comics, serialised adventure stories, puzzles and content both from new and renowned UK authors like Philip Pullman and Michael Murpurgo. The artwork is very colourful, creative and eye-catching, and the writing contains a mix of comics and factual articles. Much of the writing seemed aimed at older, confident readers – younger readers might struggle, or need help with some of the content. One big plus is that the comics are original, departing from the more familiar superhero comic book characters. There are no ads beyond those for other Phoenix publications, and the magazine is refreshingly free of commercialism and big brand tie-ins. A regular feature also encourages readers to contribute their own artwork. Although the magazine is aimed at girls and boys, in the issues we reviewed we found that male characters tended to feature predominately as the protagonists in most of the stories, and that there was a higher proportion of male characters throughout all of the content.It would be great to see a more equal balance of females featured as the protagonists throughout the magazine, and some more women creating the stories as well. Our Kid Reviewer really enjoyed the comics, reading them through cover to cover without a break, and finding the “Bunny vs Monkey” strip hilarious. Weekly. 32 pages. Available at WH Smith, Waitrose, and selected bookshops for £3.25 an issue, and by subscription – you can try four issues for £1, and then subscribe to £9.99 a month by direct debit. Suitable for: 6 -12 year comic book enthusiasts, with much of the content aimed at more confident readers. 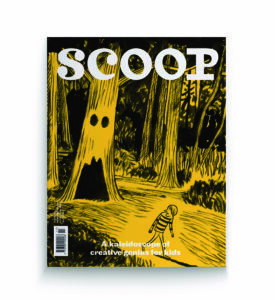 Scoop is a monthly magazine aiming to encourage readers to ‘dig into the story’ and develop their love of the written word. Lavishly designed and printed on heavyweight paper, it’s a beautiful thing. While there are book reviews, poems and short stories, the content ranges wider than stories and fiction, with science snippets, bike maintenance, playwriting tips and ‘How to paint a flower like Georgia O’Keefe’, but all written at a fairly demanding level; this is definitely a magazine aimed at confident readers. Our Kid reviewer commented, “The articles were interesting, but there was a lot of writing.” With three writing competitions a month, and the chance to review books, there’s lots of scope for keen young writers to try their hand and see if they can make it into print too. Ten editions a year, 50 pages. £44.99 for 12 months (10 issues) or available from selected bookshops. 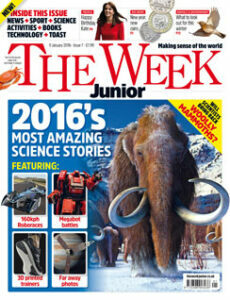 The Week Junior is an award winning magazine launched just over a year ago. Describing its content as “The World’s Best News & Facts for Young People” the magazine aims to explain serious news and world events in a way that is safe and accessible as well as being engaging and inspiring. The magazine has a reader friendly, colourful and engaging layout that packs in a huge amount of information. Each issue has regular newsy sections on topics such as national and international affairs, animals and the environment, science and technology, entertainment, people and sport. Difficult issues and world events are explained with tact and intelligence, with the serious content balanced by “Did you know” style facts and more light-hearted snippets from the week’s news. As well as news, the magazine has several weekly sections with features to encourage readers to engage actively, such as “Do Something”, “How to” and “Puzzles”. One of our favourites is “The Big Debate”, which covers two sides of a controversial subject, such as “Is gender equality important?” or “Should homework be banned?” and then invites readers to vote in an online poll. Looking at several issues, we were really impressed by the consistent equal gender representation achieved throughout each magazine. The news stories and features also represented excellent racial, cultural and body diversity too. Ad content was very low per issue, mainly of one page advertising a subscription for the Week Junior, or occasionally an appropriate book, activity or charity was advertised on the very back cover. This magazine received the big thumbs up from our Kid Reviewer, who found much to engage with in each issue, returning to the content again and again throughout the week. 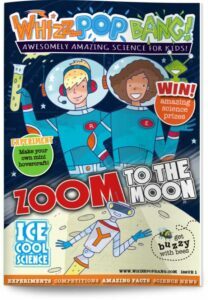 Whizz Pop Bang calls itself “the awesome science magazine for kids!”. With a clear layout and great pictures and illustrations it is absolutely packed with articles, fun facts and activities designed to get kids excited about science. Each issue contains themed experiments and activities to keep budding scientists busy for several rainy days, as well as games and a comic at the end. The magazine proudly describes itself as gender neutral because “science is just as much for girls as it is for boys”. The issues we reviewed certainly depicted an equal gender split, in addition to ethnic diversity, in terms of interviews with scientists and the children depicted throughout both in photographs and in drawings. Our Kid Reviewer particularly enjoyed the pull-out make and do sections along with the puzzles and jokes, and our whole family delighted in learning new facts ranging from the science of bubbles to different types of bridges. This magazine is linked to the National Curriculum and is a great resource for children, parents and teachers to support and inspire science learning. Let us know what you – and the kids you know – think of the magazines on offer to children. More to recommend that cater to boys and girls without falling back on stereotypes? Share them in the comments below.